Red wine marinade is excellent not only for meats but for salmon as well. Add garlic and spices like salt and fresh herbs when making your marinade. You can also add olive oil, although this is optional since salmon is already an oily fish. 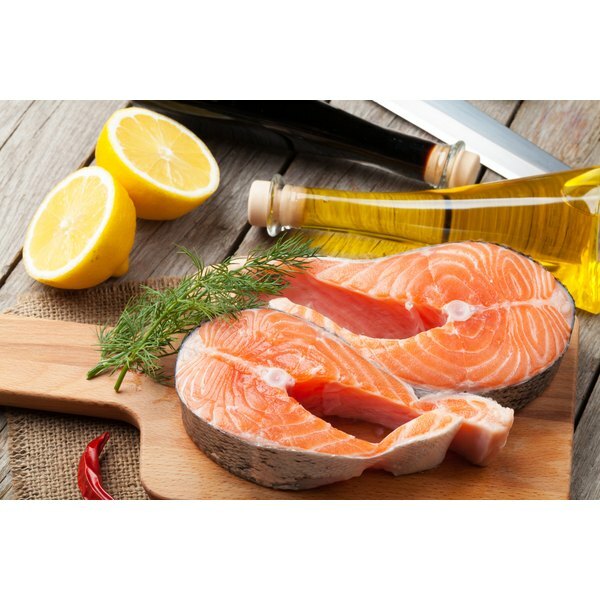 Salmon is an excellent source of omega-3 fatty acids and protein. According to the Dietary Guidelines for Americans 2010, adults should eat at least 8 oz. of seafood every week. You can make this red wine marinade beforehand and store it in the refrigerator for up to a week. Chop the onion and mince the garlic cloves. Combine in a medium saucepan the wine, onion, garlic, parsley, thyme, peppercorn, cloves and the bay leaf. Simmer over low heat for two minutes. Add salt to taste. Chill the marinade. Although you can use a cooked or uncooked marinade, cooking the ingredients briefly will help release flavors. Wash and pat dry the salmon fillets. Place them onto a large dish without overlapping. Pour the chilled marinade over the fish. Marinade anywhere from 20 minutes to 24 hours in the refrigerator. Cook the fish with a method of your choice.